Super Typhoon Mangkhut hit port operations and energy infrastructure in the region over the weekend. Operations at some ports are likely to remain suspended as the typhoon continues to wreak havoc in parts of Asia. Meanwhile, markets will keep an eye out for confirmation after reports saying US President Donald Trump is looking at another round of tariffs on $200 billion worth of Chinese goods ahead of the scheduled trade talks with Beijing. Asian refineries will be assessing their ultra-light crude procurement options this week after the market saw a drop in Iran's South Pars condensate exports due to the re-imposition of US sanctions and the startup of the Persian Gulf Star refinery. Australia's North West Shelf, Malaysian Kimanis condensate, Qatar's Deodorized Field Condensate for loading in November will be offered in the spot market. Players in the region's thermal coal market expect a breakthrough in talks to settle prices for Japanese term contracts for Australian coal to be delivered from October 1. Current prices are reflecting strong spot-traded deals. And in petrochemicals, CFR China PTA hit a five-year high at 1,080 dollars per metric ton on Thursday due to limited spot availability. The downstream polyester sector is already suffering from narrower or even negative margin and has cut operating rate to around 85% of capacity. The market expects the polyester operating rate to drop further in the short term. This week: Iran condensate exports drop, strong spot deals seen for Australia thermal coal, and PTA prices start strong at a near 5-year high. But first, markets will keep an eye out for confirmation following reports over the weekend saying US President Donald Trump is looking at another round of tariffs on Chinese goods ahead of the scheduled trade talks with Beijing. The new tariffs are expected to hit $200 billion worth of products. Weather disturbances in Asia and the US are affecting ports, energy infrastructure, and supplies in the region. Super Typhoon Mangkhut wreaked havoc in the Philippines, and southern China over the weekend, affecting movement of shipping vessels, and shutting down ports and other marine facilities. Contingency measures have been taken to minimize the typhoon's impact on energy infrastructure, without major damages heard so far. Port operations are likely to remain suspended in parts of the Philippines, Hong Kong and Guangdong China. The LNG market, on the other hand, is keeping an eye on terminal operations affected by Hurricane Florence in the US. Export activity was severely reduced at Dominion Energy's Cove Point terminal in Maryland last week. A total 29 cargoes had been exported from this terminal since it started in March. Meanwhile, refineries will be assessing their ultra-light crude procurement options this week after the market saw a drop in Iran's South Pars condensate exports due to the re-imposition of US sanctions and the startup of the Persian Gulf Star refinery. Australia's North West Shelf, Malaysian Kimanis condensate, Qatar's Deodorized Field Condensate for loading in November will be offered in the spot market. US Eagle Ford condensate, Norway's Ormen Lange, Nigeria's Escravos and Russia's new Sabetta condensate could also draw plenty of interest from Asian buyers. In coal, Asia-Pacific market players are expecting a breakthrough in talks to settle prices for Japanese term contracts for Australian thermal coal to be delivered from October 1 onwards. Australian shippers are showing offers of 115 dollars per metric ton FOB Newcastle to their Japanese customers who counter-offered a price of about 105 dollars per metric ton. The current prices reflect strong spot-traded deals for this type of thermal coal. 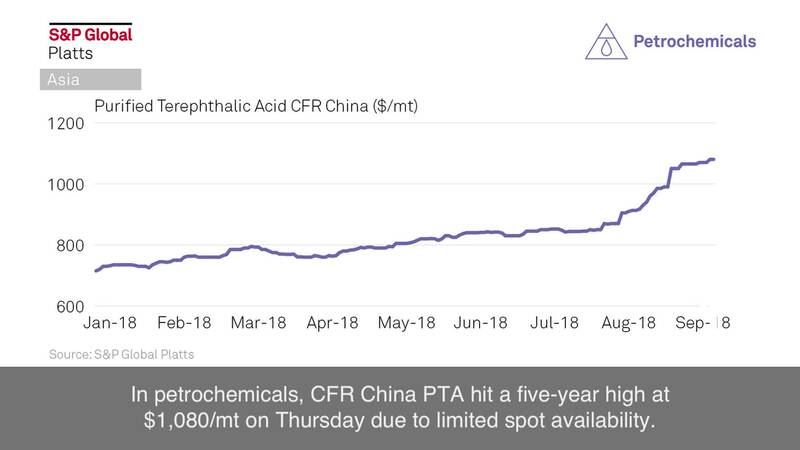 In petrochemicals, CFR China PTA hit a five-year high at 1,080 dollars per metric ton on Thursday due to limited spot availability. The downstream polyester sector is already suffering from narrower or even negative margin and has cut operating rate to around 85% of capacity. The market expects the polyester operating rate to drop further in the short term. Will this mark the beginning of PTA prices tapering off? Share your thoughts on Twitter with the hashtag PlattsMM.